The Premise from the Publisher: "In the kingdom of Sempera, time is currency—extracted from blood, bound to iron, and consumed to add time to one’s own lifespan. The rich aristocracy, like the Gerlings, tax the poor to the hilt, extending their own lives by centuries. No one resents the Gerlings more than Jules Ember. A decade ago, she and her father were servants at Everless, the Gerlings’ palatial estate, until a fateful accident forced them to flee in the dead of night. When Jules discovers that her father is dying, she knows that she must return to Everless to earn more time for him before she loses him forever. But going back to Everless brings more danger—and temptation—than Jules could have ever imagined. Soon she’s caught in a tangle of violent secrets and finds her heart torn between two people she thought she’d never see again. Her decisions have the power to change her fate—and the fate of time itself" (HC). My overall thoughts and review: It's been a while since I've read a YA fantasy that has drawn me in so quickly like this one. I was definitely intrigued by the premise because the concept of currency being time sounded super interesting but also super dark. It gave off a feel of a darker Furthermore by Tahereh Mafi, but it also definitely had some Red Queen by Victoria Aveyard vibes. The story follows a young girl named Jules, who comes from an extremely poor family of just her and her father. They are late on the rent on their homes and they are constantly trying to come up with money to pay the collectors. She realizes that her father has been bleeding his time and becoming sicker and sicker and wants to do something to help. They were previously servants at Everless, but a horrible accident happened when she was younger that caused them to flee and never look back. Now, Everless is the place that Jules can make a living to help her father, despite the dark past they had. Everless is also home to Roan, the young boy she used to love who is set to marry a new princess, Ina. Jules finds herself swept up in the mystery of the Gerlings, how the aristocracy are, but also what really happened all those years ago that caused her to flee with her father. There's mystery, friendship, and a bit of romance. There are so many twists and turns that I didn't see coming and there are so many scenes that definitely tugged at my heartstrings. I really enjoyed this because Jules' love story didn't center the whole story. There was lots of world building on Holland's part which I really appreciated. Holland wove in such great history for this world and gave each character (even small characters like Tam) a lot of background. Everyone character felt fully fleshed out and that's a great accomplishment in a novel. I really enjoyed this and I definitely seeing it becoming a wonderful series. I really hope that it isn't the end of Jules story, because I totally want to learn more. I also want to see more of certain characters, but I won't say much out of the risk of spoiling anything. Overall, this is how a YA fantasy should be! I really enjoyed it and I can't wait to read more from Holland in the future. 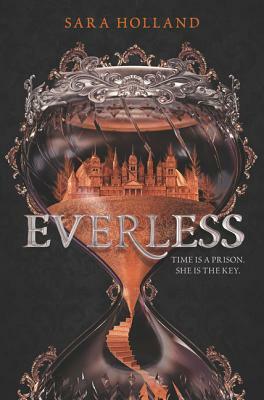 When I first set about drafting EVERLESS, I knew I wanted to channel the qualities of the books I love the most into the one I was creating. One of the first things that any fantasy author has to consider is worldbuilding, and so I gave a lot of thought to what kind of world I wanted Sempera to be--both for the characters living in it, and for the readers. Perusing my shelves, I noticed a few common themes, and later realized that several of them had made their way into EVERLESS. I love concrete, detailed worlds. I love learning as much as I can about whatever fictional world I happen to be in, and the lives of the people in it, even if the information doesn't directly affect the plot or main characters. Tell me what everyone is eating, what their clothes and houses look like. How does the government work? What is a typical day like for someone in this world? I love the feeling of pervasive magic. When it comes to magic systems, I love stories and worlds where it feels like there's always one more layer to pull back, one more place to look. When there isn't just one magical thing--but three, or a dozen, or too many to fit on the page. Think Harry Potter, the Shadowhunter world, Daughter of Smoke and Bone, or His Dark Materials. In all of these, you get the sense that it's not just our world with one magical tweak--everything, everywhere is magical! 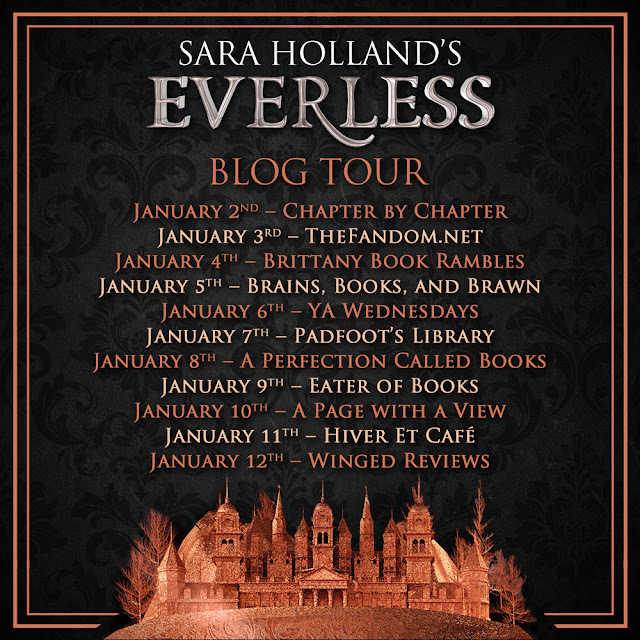 Be sure to check out the other stops on the blog tour for more content on EVERLESS! Disclaimer: I had an e-ARC of this copy ahead of time and I collaborated with Glasstown Entertainment and Sara Holland to participate in this blog tour. All opinions are my own.